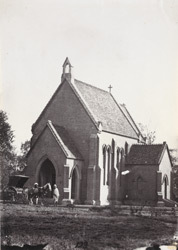 Photograph of a Church at Gujranwala in Punjab, Pakistan from the Brandreth Collection: 'Views in Simla, Cashmere and the Punjaub' taken by an unknown photographer in 1865. Gujranwala is an important city for Sikhs it was the birthplace of Maharaja Ranjit Singh, the home of his father, Mahan Singh and grandfather, Charan Singh. Ranjit Singh (1780-1839), known as the 'Lion of the Punjab' was one of the most celebrated rulers in India, he persuaded rival Sikh chieftans to unite forming the first Sikh Kingdom of Punjab. Gujranwala was their headquarters until Ranjit Singh captured Lahore in 1799 and made that his capital.